Though flowers are themselves worthy of appreciation for their natural beauty, in the hearts and minds of many people, they have long since gradually progressed from being objects of objective viewing to becoming trusted friends for conveying metaphorical ideas and the lodging of feelings. 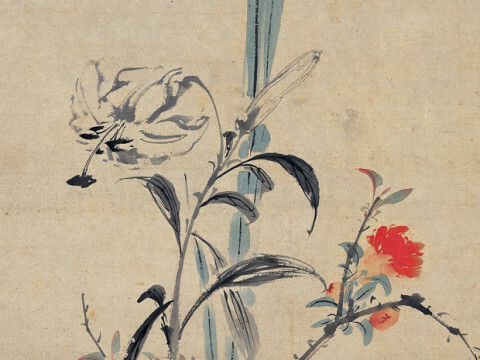 For this reason, the line “Fallen red (blossoms) are not objects without feeling (落紅不是無情物)” does not just mean flowers blooming and falling with the times. In situations such as this, people have endowed flowers with auspicious meaning, often borrowing Chinese characters that are homonyms or homophones to transform blossoms into joyous or fine expressions, becoming symbolic embodiments of many auspicious phrases. 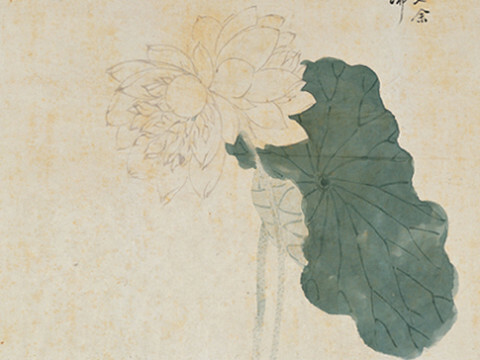 In the history of flower painting, some artists indeed carefully crafted imagery to suggest such blessing and fortune. This differs from simple depictions of floral imagery, because they not only are beautiful artworks but also paintings with double meaning. 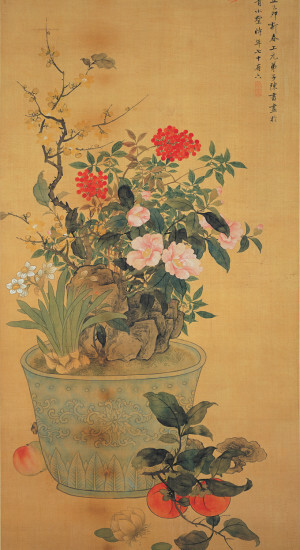 This section presents both types of artwork together to explain the auspicious meaning embodied by the blossoms, also revealing the diverse features of flower paintings down through the ages. The Italian missionary-artist Giuseppe Castiglione (Chinese name: Lang Shining) arrived in China in 1715 to do missionary work and was summoned to the court, where he came to serve in the Painting Academy. He brought the realistic techniques of European oil painting and one-point perspective with him to the court. Castiglione excelled at bird-and-flower subjects “sketched from life (寫生)” and was especially renowned for his depictions of horses. Giuseppe Castiglione fused traditional Chinese painting methods with Western techniques of perspective. 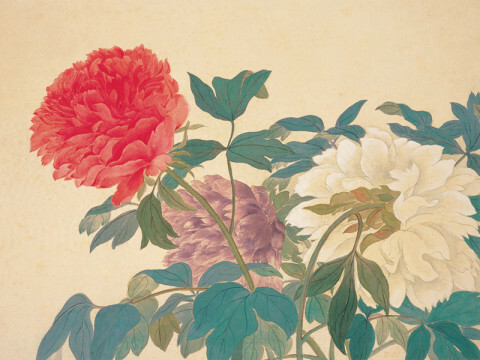 Here he painted peonies with light and dark hues to express a sense of layering and volume. The leaves also turn and extend in space, the veins outlined with great realism to create an extremely rich and volumetric effect. The angular blue-and-white vase shown here is decorated with a morning glory (牽牛花) pattern and features two dragon-head handles. Strong lighting emphasizes the shine and luster of the porcelain, the colors having a dramatic chiaroscuro effect of light and shade. 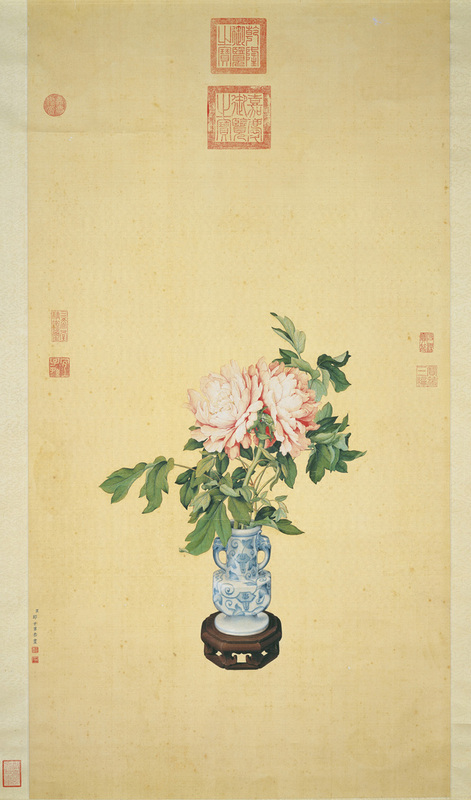 Placed in the vase is a rare double-blossom branch of peonies, symbolizing auspicious fortune as well as peace and wealth (平安富贵). Chen Shu (style name Nanlou 南樓; sobriquets Shangyuan Dizi 上元弟子and Fu’an復庵; late sobriquet Nanlou Laoren 南樓老人) was a native of Jiaxing (嘉興) in Zhejiang (浙江). He excelled at painting bird-and-flower and grass-and-insect subjects, also being gifted at landscapes and figures. This work was done at the age of 76. Chen Hongshou, a native of Zhuji (諸暨) in Zhejiang (浙江), had the style name Zhanghou (章侯), sobriquets Laolian (老蓮) and Huichi (悔遲). He specialized in figures as well as landscapes and bird-and-flower subjects, often using exaggerated techniques to express an interest in archaic and distorted shapes. Wen Zhengming, a native of Changzhou (長洲) in Jiangsu (江蘇), excelled at poetry, painting, and calligraphy. 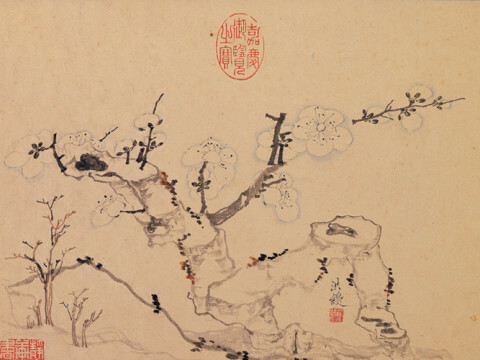 In painting, he studied under Shen Zhou (沈周, 1427-1509), the two of them becoming influential leaders in painting during the middle and late Ming dynasty. Shen Zhou, style name Qi’nan (启南), was a native of Changzhou (長洲, modern Wuxian 吳縣) in Jiangsu (江蘇). He excelled at the arts of poetry, calligraphy, and painting, especially landscapes in the latter. 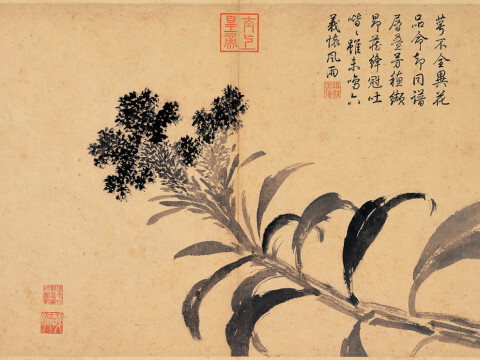 Shen Zhou was also skilled at depicting flowers, fruits, and vegetables as well as animals, his use of brush and ink having an archaic simplicity to it. The cockscomb mostly blooms in summer, its numerous individual blossoms forming clusters that resemble the cockscomb of a rooster, hence the name. It comes in a variety of shapes, including feathery and puffed forms. Its alternating leaf blades are either slightly ovoid or have a long tip at the front. 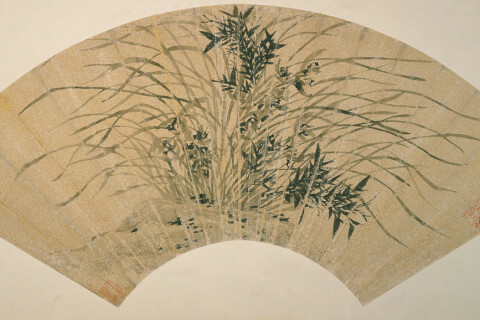 The one shown here has leaves of various lengths turning about, also revealing the artist’s interest in “flying white (飛白)” calligraphy with streaks in the brushwork. Another name in Chinese for the cockscomb translates as “High crown (高冠),” which is also an auspicious symbol for promotion in rank as well as high position and a handsome salary. 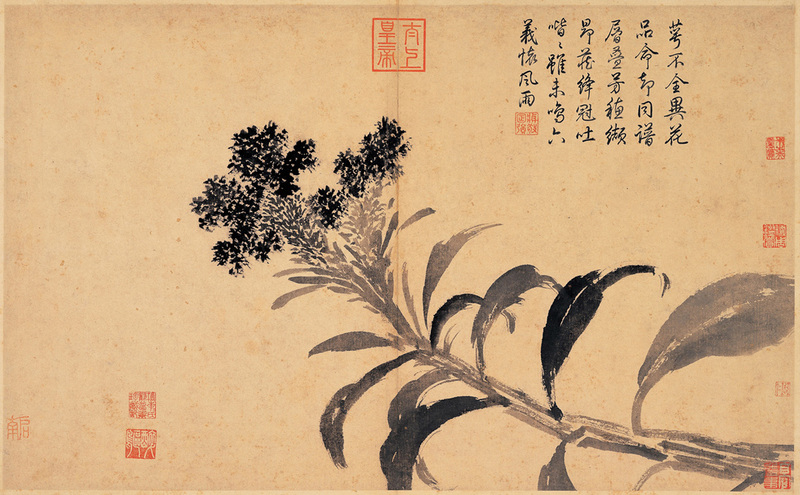 In this leaf from “Album of Sketching from Life (寫生冊),” the sketchy flowers have been rendered with succinct brushwork and ink that is strong and thick, making this work from 1494 a marvelous example of Shen Zhou’s later painting.